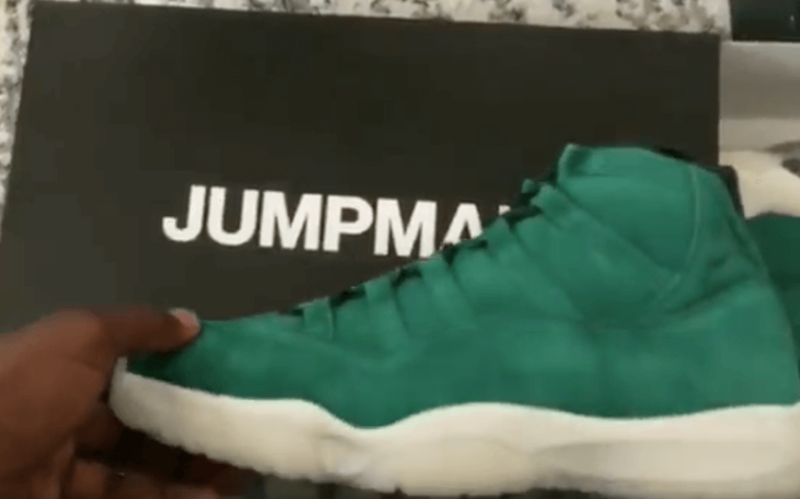 Philadelphia wide receiver Alshon Jeffery receives his personal Super Bowl iteration of Air Jordan 11. The shoe basically comes covered in a “Grey Suede” makeover that reflects the build of Air Jordan 11 from 2016. This particular pair has been enhanced with a full Green suede upper complemented with a tonal suede mudguard. Moreover, the shoe has been further highlighted with debossed Jumpman ankle logo accompanied by a white midsole and milky translucent outsole that completes the whole design altogether. Check out a glimpse below and stay tuned for more future updates.